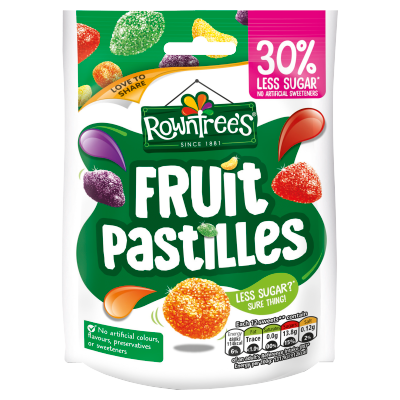 ROWNTREE'S 30% REDUCED SUGAR FRUIT PASTILLES are completely free from any artificial sweeteners and are still bursting with irresistible fruity flavour. 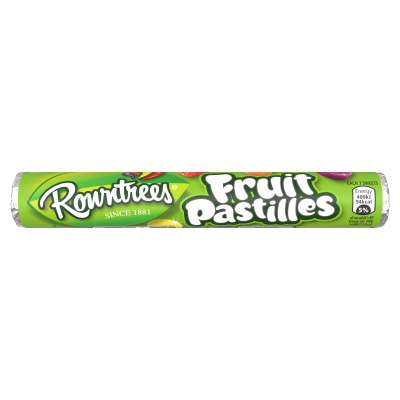 Fruit Pastilles are the oldest sweet in the ROWNTREE'S family. For over 130 years it's their irresistible fruity taste that makes it impossible not to chew them. With delicious blackcurrant, lemon, strawberry, lime and orange flavours to try, could you take on the chew challenge? 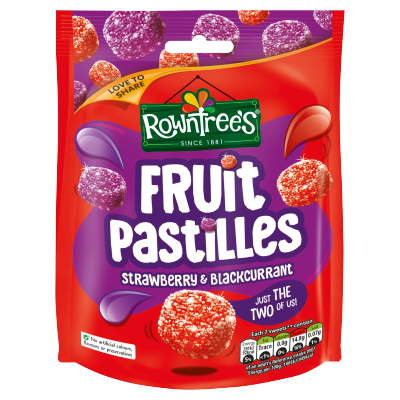 ROWNTREE'S Fruit Pastilles: deliciously fruity tasting sweets you can't help but chew! In 1862, Henry Rowntree bought a simple cocoa works in the city of York and turned it into a confectionery company. Henry was joined in business in 1869 by his brother Joseph Rowntree who eventually took over and transformed the company's fortunes. 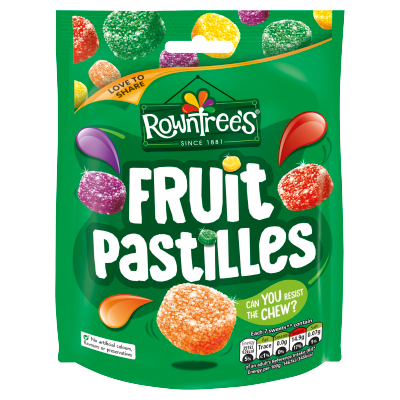 The brothers hired French confectioner August Claude Gaget, and with his expertise, they developed the recipe for ROWNTREE'S Fruit Pastilles, which they launched in 1881. Following on from this, the confectionery company developed ROWNTREE'S Fruit Gums, JELLY TOTS and TOOTY FROOTIES. 2009 saw the launch of the newest edition to the family - ROWNTREE'S RANDOMS. Every bag of ROWNTREE'S RANDOMS contains a different combination of textures, shapes and fruity flavours. ROWNTREE'S pledge no artificial colours, flavours or preservatives in any of their products.